Celebrating a Wonderland themed birthday party. Join Alice, the White Rabbit and friends down the rabbit hole with our Alice in Wonderland / Through the looking glass party invitation. Can be used for a birthday, high tea or bridal shower celebration. 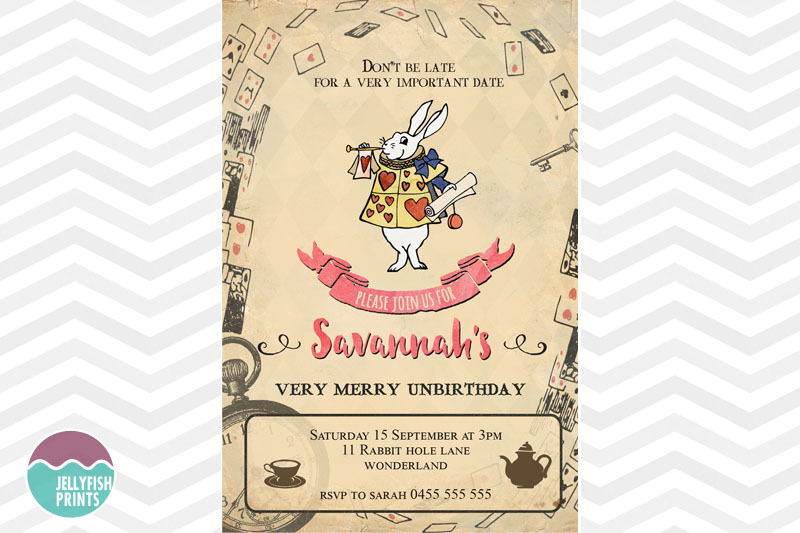 Our lovely Alice in wonderland birthday invitation has a vintage feel with a lightly checkered background. The White Rabbit is framed by a fluttering of playing cards as portrayed in the book as well as an old pocket watch timepiece and key. Simply lovely for a High tea or a perhaps Mad hatters tea party. Your printable Alice in Wonderland invitations will be personalised with your party details. There is no photograph in this invitation but let us know if that is something you would like to include and we will work it in somehow.